Is there a way to charge my two 6-volt batteries with a regular stand-alone battery charger? If so how would you hook up the positive and negative charger clamps? George, I’m going to assume you are referring to a stand-alone battery charger that is 12-volts only. I mention this because some shop chargers are equipped with a 6-volt output option as well as 12-volts DC. Since all DC components on RVs operate on 12-volts, (water pump, fans, lamps, etc. ), your two, 6-volt batteries, as installed, are still set up to produce a 12-volt final output. The only difference is the connection between the two batteries. 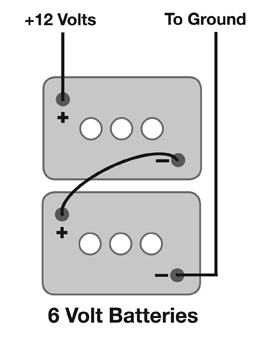 At the basic level, two 6-volt batteries are wired in “series” and two or more 12-volt batteries are wired in “parallel” in order to produce 12-volts final output. Take a look at the diagrams here; two, 6-volt batteries above and two, 12-volt batteries below. The final output that provides battery power to the components in the RV is still 12-volts DC. 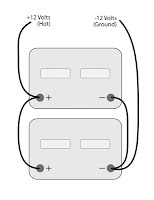 Therefore, both configurations can be charged by any 12-volt battery charger by simply connecting the charger’s red cable clamp to the “plus” 12-volt terminal lead and the black or ground cable clamp to the negative terminal as shown here. But a word of caution! 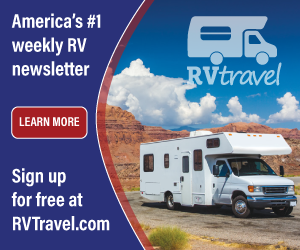 Notice on the 6-volt battery diagram, you must know which battery feeds the positive voltage to the RV and which battery represents the negative connection. 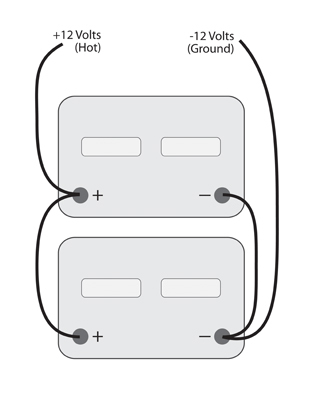 If your series connected batteries look similar to those depicted here, then all you do is connect them as shown. If yours are wired differently, do let me know and we’ll investigate further. Bottom line: 12-volts is still 12-volts. You do not want to connect either battery charger lead to the posts that make the interconnection between the two 6-volt batteries.